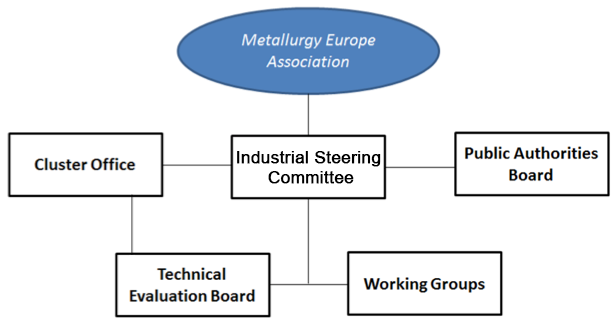 Executive Bodies of the Metallurgy Europe Association are the Metallurgy Europe Industrial Steering Committee (ISC), the Cluster Office (CO), the Technical Evaluation Board (TEB), the Public Authorities Board (PAB) and ad-hoc Working Groups (WG), as shown below. proposed modifications to the Constitution. providing secure IT systems and administration. The Technical Evaluation Board is responsible for the overall quality, coherence and consistency of the evaluation of the project proposals, within the fourteen top-level R&D Topics. Working Groups are foreseen in order to support the work of the Industrial Steering Committee and the Technical Evaluation Board.